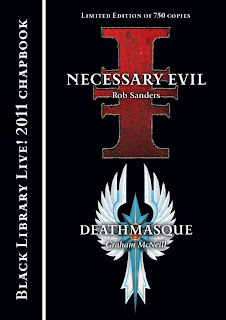 Lord of the Night reviews the yearly chapbook by Black Library, this year featuring the stories Necessary Evil by Rob Sanders and Deathmasque by Graham McNeill. Well, the chapbook arrived today and after about five to ten minutes of reading I had finished both stories, which since this is a limited edition product I will provide a brief synopsis of both so that others can know the story even if they were unable to obtain the book. 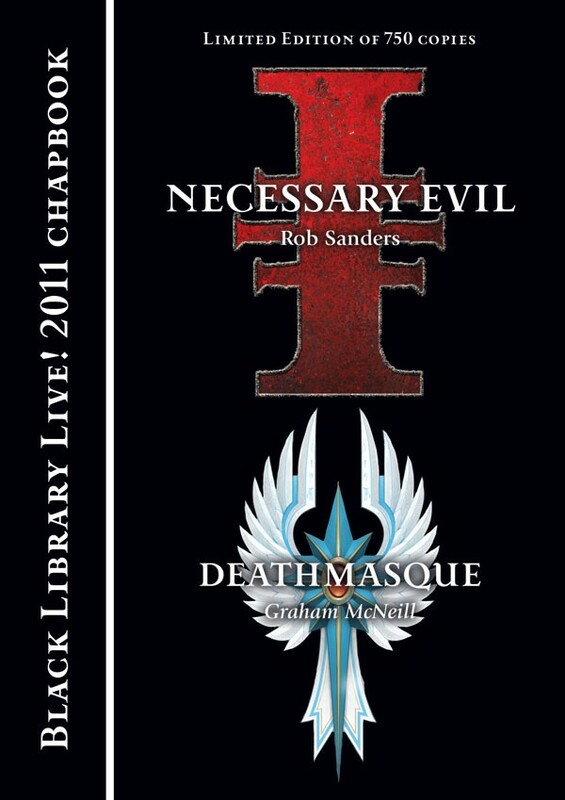 The first story titled Necessary Evil by Rob Sanders is an Inquisitor Czevak tale. Czevak arrives on a Daemon World named Nereus after stealing the Atlas Infernal. After taking in the landscape and noting that he is being hunted by many different groups. Chaos hunts him for what he could do, the Imperium hunts him for what he has done, and the Eldar hunt him for what he might do. Suddenly a shuttle crash wounds the Inquisitor and he is taken in by an underground society that work together to survive the Daemon World. His savior, a pregnant women named Myra takes him to meet the Curator where Czevak explains his presence. He is searching for an artifact named the Dreadstaff, an ancient Crozius Arcanum that belonged to the Word Bearers legion. He reveals that the warband of Azhek Ahriman is chasing after him and seeks the staff, however he is told that no tainted items are kept here. Unsatisfied with the rebuke Czevak follows the Curator secretly and learns that some of the colonists are Chaos cultists. Returning to Myra as the Thousand Sons arrive and begin massacring the colony he finds that the bell used to alert the colony of shuttle crashes in fact houses the Dreadstaff, he is able to throw it into the daemon-infested ocean where it will never be retrieved. Taking Myra and her child with him he attempts to escape only to discover that Myra’s child is a Genestealer, as is the entire colony barring the human Myra who is merely infected by them. Regrettably leaving her behind and the colony to their fates Czevak enters the webway portal, unsure of his next destination, wondering who will be victorious in the battle raging behind him, and who of the Thousand Sons and the Genestealers is the more necessary evil. The sole character of import being Czevak the mini-story focuses on showing us a glimpse of what the renegade Inquisitor. I felt that he was very far from what most expected, he actually displayed sorrow at having to leave Myra behind and possessed more human instincts then some Inquisitors have displayed. I look forward to seeing more of him in the future. The pacing was quite good and worked well with the limited span of twelve pages of story, but I felt that this story format was good enough to have been a short-story rather then a mini-story. I give Necessary Evil a 7/10, a good mini-story that could have been a great short-story. Atlas Infernal cannot be released quick enough, I want it now!. The second story Deathmasque by Graham McNeill takes place in Ulthuan, in Tor Yvresse during the Festival of Masques. A grim figure stalks through the empty streets as others flock to the festival, declaring that the things they celebrate, hope and love and the future are meaningless. He thinks of the goblin attack on Tor Yvresse that was bested by Eltharion the Grim and claims that he lost everything in those days. Meanwhile a travelling minstrel prepares to tell the tale of Eltharion to the gathered Elves as the unnamed figure makes his way through the crowd, seemingly intent on killing the minstrel and showing the people that the festival and what it embodies means nothing. However he is intercepted by a woman wearing a mask with a single tear falling from it. After claiming it would be unwise to kill her that it would anger her husband, who she claims is a great hunter named Kurnous the assassin declares her mad and attempts to move on. She follows him and debates with him about the virtues of hope and the future while the unnamed figure refutes her points, she continues tries to make him see the good side of the world and that it is not solely formed of doom and misery as he believes. As the assassin reaches the theater where the minstrel is to tell his tale the woman disappears and leaves him to his task, but surprisingly the minstrel asks him to join him on stage and together they will tell the tale of Eltharion. Together they perform the tale and as the assassin is about to kill the minstrel he sees the woman again and relents, changing his mind. He casts his mask away revealing that he himself is Eltharion the Grim who though his doom still remains he now has hope for the future and when asked by the minstrel, who knew both his identity and intention, why he changed his mind, Eltharion replies that he met a woman, and says that she was hope, simply hope. I was genuinely surprised by the identity of the main character of this novel, and seeing the world from his gloomy perspective was quite intriguing and the mysterious woman, whose identity is quite clear when you think about it, was a good foil for him, espousing the values of hope and love. It made for quite a good debate. The pacing of the story was quite good, as the assassin drew closer and closer the debate raged on and even without the mystery woman’s presence his own thoughts continued it on, until the final act when the entire story comes together in its conclusion. I give Deathmasque an 7.5/10 as a good mini-story that shed some light on the inner workings of a very interesting character, and for one hell of a guest appearance. I would recommend buying this while its still available. Its only £5 and thats a small price to pay for two quite good stories, even if you’ll likely finish them in under ten minutes.